In the 1970s, Stephen Hawking made an audacious prediction that black holes aren’t totally black; they evaporate over time, emitting tiny amounts of radiation in the process. Now Israeli physicists have reported the strongest evidence to date that Hawking was right in a new paper in Nature Physics. According to quantum mechanics, even the vacuum of space isn’t truly empty. So-called “virtual particles” can pop in and out of existence over such short time frames that they don’t violate established laws of physics. But if a virtual particle pair appears at the event horizon of a black hole, and one of the pair falls in, the black hole would appear to be emitting photons (particles of light), losing a bit of its mass in the process. The bigger the black hole, the longer it takes to evaporate. So-called “mini-black holes, which physicists hope to create at the Large Hadron Collider, would wink out of existence within fractions of a second. Hawing’s idea has enormous implications for theoretical physics, most notably for the black hole information paradox. But how do you test such an audacious hypothesis? In 1981, Bill Unruh , a physicist at the University of British Columbia, Vancouver, proposed a thought experiment involving a sonic analogue of a black hole he nicknamed a “dumb hole”—except in this case it is sound, not light, that becomes trapped in a kind of event horizon. Unruh drew an analogy with a waterfall where the water flows faster and faster as it falls over the edge. Eventually the water will be flowing faster than sound can travel through water, so any phonons (particles of sound) trying to escape will just get sucked back in. Dumb holes don’t actually exist in nature, although Unruh loves to tell people that we create rotating black hole analogues every time we take a bath. Surface waves form in the tub as water swirls down the drain, and when it’s shallow enough, the water flowing down the drain moves faster than those surface waves. But physicists thought it should be possible to create analogue black holes in the lab, not out of sound, but with Bose-Einstein condensates—exotic forms of ultra-cold quantum states matter where a bunch of atoms behave like a single atom. In 2009, Jeff Steinhauer’s lab at the Israel Institute of Technology (Technion) did just that: they briefly produced a supersonic flow for about eight milliseconds in a soup of 100,000 chilled rubidium atoms. This was exciting stuff, because it offered the potential to test Hawking’s prediction. Black hole analogues should emit the equivalent of Hawking radiation, complete with entangled phonons. 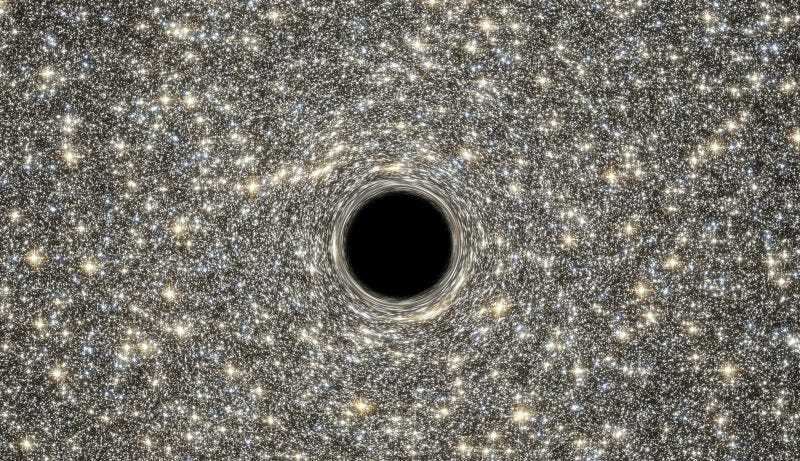 In 2014, Steinhauer reported the first hints of the phenomenon in one of his acoustic black hole experiments, after figuring out how to create the sonic equivalent of a laser’s beam-generating cavity to boost the signal. It wasn’t a slam dunk, however. There was still the possibility that the signal was really just noise in the system, since the observed radiation had to be triggered. But now Steinhauer says his lab has improved its experimental setup sufficiently that it’s observed entangled phonons being emitted by an acoustic black hole. And that radiation arises from the Bose-Einstein Condensate itself, with no need for a trigger. If the result holds up, this would be a very big deal for theoretical physics, since it’s a key factor in resolving the black hole information paradox, and one day devising a unified theory that merges quantum mechanics with general relativity. It could also snag Hawking a coveted Nobel Prize, some 40 years after he made that first prediction.